DIRECTIONS for data interpretation questions 1 to 5: Study the graph and table below and answer the questions. What was the % YOY growth in industrial output, between the two years? If in 1997-98, Paper were to account for 12% weight in the overall industrial output, at what rate should it grow assuming that the other sectors grow at 10 % each? Explanation: The best answer is 2. Current weight of paper is 6%. Assuming total output as 100, paper accounts for 6 units. If the overall industrial output in 1997-98 were to grow by 10 % and the growth of the chemical sector during this period was 26 %, what % weight would it have in the industrial output in 1997-98? Explanation: The best answer is 1. If the cotton textile sector continued to grow at the same rate, in how many more years will its output double? Current growth rate of cotton sector = 15%. Applying the CI basic, the total time becomes roughly 5 yrs and 3 months. The questions is how many more years, hence option 1st is the answer. Which one of the following cannot be inferred? 1. 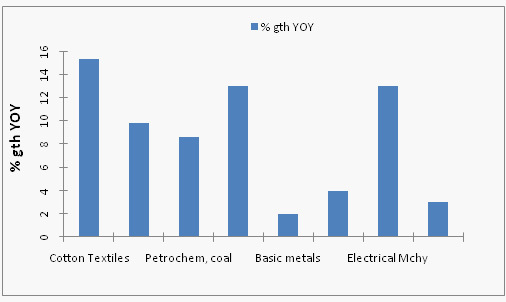 The top three sectors accounted for more than 60% weight in the overall industrial production of the country. 2. 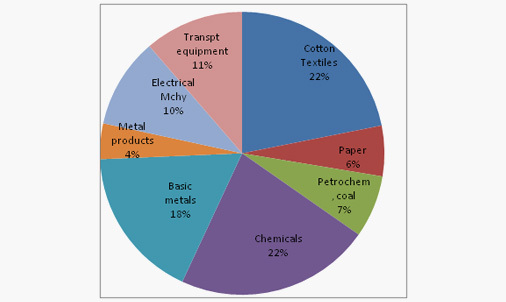 The smallest three sectors accounted for less than 20% weight in the overall industrial production of the country. 3. Metals accounted for over a fifth of the overall industrial production of the country. 4. Mining, necessarily, could not have accounted for more than a fifth of the industrial production of the country. Explanation: The best answer is 4. Which company had the highest capacity utilisation? 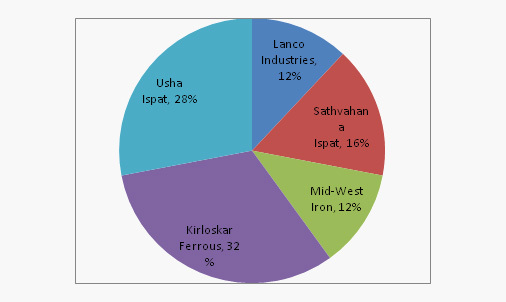 Explanation: Capacity utilisation: By observation it has to be Mid west iron or Usha Ispat. Mid west iron ≥ 63214/90000 x 100 = 70% nearly. Usha Ispat 194176 / 211 x 100 = 92% nearly. Hence Usha Ispat is the answer, thus 3rd option. Which company had the lowest capital cost per tonne of capacity? Lanco = 540 x 106 / 90 x 103 = Rs. 6,000. Usha Ispat = 884 x 106 / 211 x 103 = Rs. 4,000. Hence Usha Ispat, 4th option. If the given capacity of the five companies account for 87% of the total capacity in the country, what is the total capacity in the country? What is the capacity utilisation of the company, which has the highest capacity? What is the aggregate capacity utilisation of the five companies in 1994-95?